Just a short update tonight - that's the plan, anyway, but you know how loquacious I get, even late at night when I'm terribly tired. We'll just have to see, won't we? I managed 4 1/2 hours of sleep last night, which is better than four hours but not exactly healthy. But it was worth it. The house is the cleanest it's been in years. I don't know whether you can tell that from these pictures, but in person the change is dramatic. John and I are both pleased and relieved. The appraiser was pleasant, and didn't diss the house at all. Apparently a working furnace counts more in the valuation than non-working central air conditioning, for all that the former is barely needed in Arizona and the latter is almost essential. The appraiser said that such standards were set by people "who have probably never been south of Duluth." He was satisfied with the full swimming pool, even though it was dirty, and I was pleasantly surprised to learn that both John's office and mine count as bedrooms, and that my office counts toward square footage despite not being on the duct work. I was sleepy, but I got through the day at work and was moderately productive. Tonight I've been mostly rereading Dragonsinger, and worrying a little at how heavily that book influenced bits of the Mâvarin books. We ate dinner I-forget-where in celebration of the end of the appraisal stress and the cleaning. I mean it. I honestly can't remember where we had dinner tonight. After dinner we used up a bit of our lavish and newly-acquired trade credit at Bookman's, where I spent a good part of last Saturday unloading excess books and video. Tomorrow we head for Phoenix and IKEA. * Note to Sarah and other Beatle fans: I will be updating the pie entry when I'm done with this one. I can say no more. 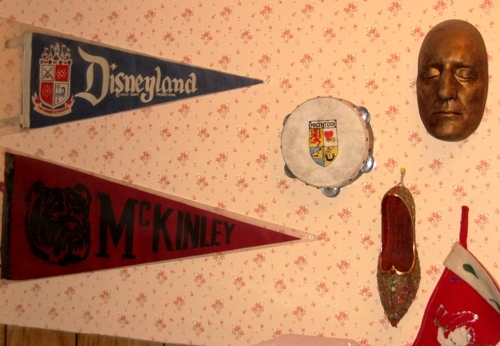 * Ever since receiving several fun comments to the Monday Photo Shoot entry, I've been thinking of this house as a "Museum of the Weird," which was an early name and concept for what became the Haunted Mansion at Disneyland. As such, I have a modest exhibit for you tonight. 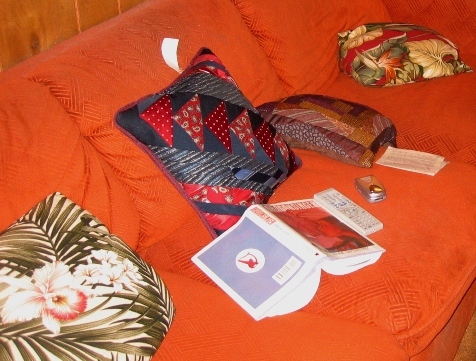 See the two middle cushions on the bright orange couch? My stepmother Ruth made them from some of my Dad's vintage ties. We think they're wonderful! 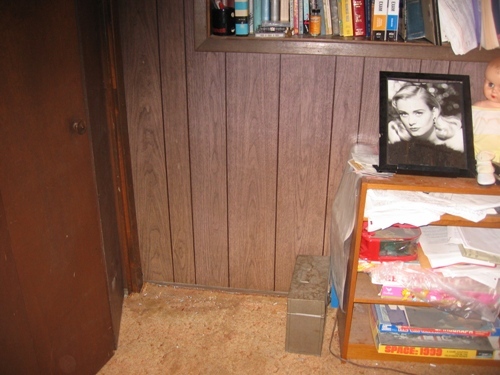 In the other picture, the doll is missing a foot, but not a shoe, the framed photo is a Quantum Leap prop, and the bookcase contains games from two less-than-wonderful old tv shows: Space: 1999 and The Six Million Dollar Man. 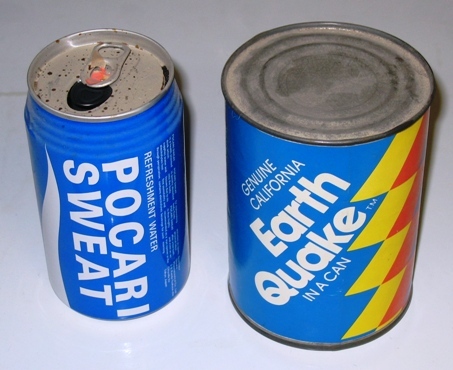 If none of that is weird enough for you, let me make amends by explaining that the earthquake in a can is supposed to rock and shake if you spin it and then set it down. Being over 20 years old, though, it no longer does this, as we discovered when John tried to demonstrate this function for me. I'm sure I can come up with weirder stuff later for you. Yawn. That's enough for now. I'll talk to you again on Sunday. Hi, there! Who is the author of Dragonsinger? Is it Anne McCaffrey? I love all her Dragon books...but my favorite is a nondragon book called Crystal Singer...I must have read that book six times. You always have interesting things to say. Enjoyed your entry today! Congrats on getting through the appraisal! I love the necktie pillows!! What a cool idea! Your Monday Photo Shoot: Snap a picture of something odd that you have in your house. And, no, don't take any pictures of your spouse. Really, that's just mean. No, I'm talking some object that when people see it in your house, they stop and say something like "Huh. You don't see that every day." - J.S. I must have some odd or unusual things somewhere, but nothing of the sort really comes to mind at the moment. It turns out that pretty much all the really oddball objects in our house are things that John brought into it. Everything I will be featuring in this entry, except for the TV minibar and the EP Bunny, is in John's office. We resisted buying this for perhaps a year at the Casa Des Los Niños Thrift Shop, but ultimately we had to get it. 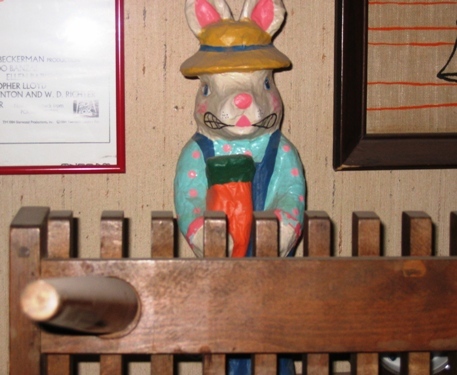 It reminded us of the bunny drawings John's former supervisor, E.P., used to doodle at his old job back in Columbus. I especially like this papier maché bunny's fierce teeth. When I went to photograph the E.P. 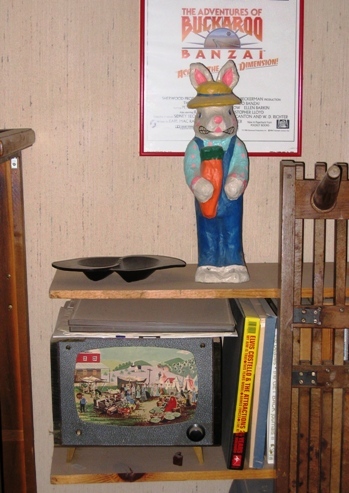 Bunny, I was taken with the way the upended vintage coffee table formed an accidental fence for the farmer bunny to stand behind. 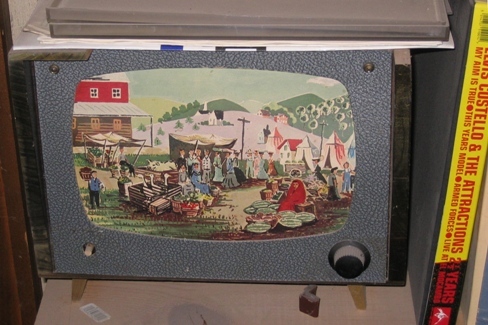 Inside this quaint and unconvincing representation of a color television is a set of bar supplies - shaker and glasses, mostly, if memory serves. I didn't feel like opening it tonight to show you, but take my word for it. We got it at the estate sale of someone who had a lot of alcohol-related memorabilia, plus multiple copies of the first five issues of National Lampoon. John sold many of the Lampoons on eBay some years back, when we desperatively needed the cash to pay a tax bill. That's all part of a story I really mustn't tell here. Too bad there's a knob missing. I think there's a shot glass missing, too. But what the heck. What did we expect for the $2.00 we probably paid for this 45-year-old curiosity? Answer: precisely what we got. This is so you can see the rest of the bunny, and get an idea of relative sizes. It's also an excuse to show off part of John's framed Buckaroo Banzai poster. Here are two definitely odd cans from John's office. I thought I ought to show you how they really looked before I messed around with them with PhotoStudio 2000. 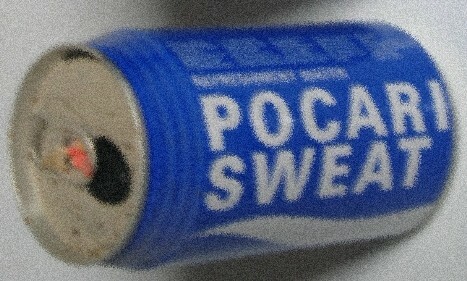 This is a real Japanese product, which John got from his pen pal Kooichi. We've never figured out why the English word "sweat" would have the right connotations in Japan for something you'd want to pour down your throat. Maybe it's supposed to mean that it's a sports drink. In any case, John drank at least part of the contents of this can. No, it didn't taste like perspiration (not that John has tasted perspiration, particularly). I gather that it was a mildly sweetened soft drink, nothing exciting. Naturally, John kept the can. Judging from the sound and the heft when I pick this up and shake it, the can seems to have a rock in it. 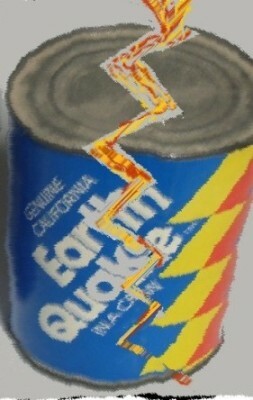 Maybe it's from the San Andreas Fault, but maybe not. Really, it's kind of a disappointment. So was my attempt at special effects for this photo. This is probably from the 1950s, probably an eBay purchase. This was his mother's maiden name. John's MacIntosh grandfather was a minor oil tycoon in Ohio,many years ago. Or maybe death mask, I forget which. Either way, it's supposedto have been cast from Rathbone's actual face. This was another eBay purchase. Sherlock Holmes kept his tobacco in a persian slipper. John doesn't keep tobacco, but he has the slipper. I think this stocking goes back to when John was a baby. Certainly there's a baby depicted on it. We don't fill this at Christmas, because we don't want to wear it out. From John's high school in Canton, Ohio. Sorry this wasn't big on words tonight. I've been editing dozens of dramatic new monsoon pictures, some of which you'll see tomorrow night. Now I've got to upload this and get to bed! I think your collection beats my choice!!! That Basil Rathbone mask certainly is weird. I hope you never have to sleep in that room. well karen, that is the most unusual collection I've seen! sheesh, I thought the teeth I posted was tops, but you got me beat! Oh i would love to come to your house to see all the interesting things. It looks like itd be fun. Do you live in a house or one of those freaky roadside museums of strange things one might pass on a cross counrty trip?